If you want to have a home to be proud of, you should never decorate your living room and fill it with mass produced furniture from a well-known Swedish retailer or equivalent. Why have a room that’s the same as thousands of others? Your home is an extension of yourself and should reflect your personality. Let us help you create a home to be proud of. We can design, make and build bespoke furniture for your living room, upholstered in a fabric you choose with the exact finish you love. We are the handmade furniture and cabinet specialists. Classically beautiful, this piece has been lovingly handcrafted from oak. It can be polished to any colour and you can choose which handles suit your décor. It’s a piece to treasure for years to come. If your living room has a bay window, why not choose to add a stunning side chair and matching small foot stool? We love the striking solid beech wood tapered legs and with countless fabric options you can choose something to match or contrast with your curtains or sofas, depending on the look you’re going for. It’s stylish and comfortable, what more could you want? If you own a contemporary or ultra-modern home, you may want statement bespoke furniture that’s at the cutting edge of design. The Domeba armchair could be perfect. It’s high end, luxury, worthy of a place in a celebrity’s penthouse. It’s a chair that demands attention with its side saddle panels and tear drop shaped arms, especially if you opt for real cow hide fabric. Ideally, you should place Domeba Armchair with space all around so it can be admired from every angle. It looks great paired with a matching Domeba large or small stool. Why not opt for a Domeba sofa too? On your walls, our one-of-a-kind bespoke Wayney Edge Shelving could be the icing on the cake. It’s truly unique, so if you want it you’ll have to reserve it quick as no more will be made once it’s sold. It has seven rough sawn shelves and naturally beautiful waney edge side panels. It’s a real statement piece. 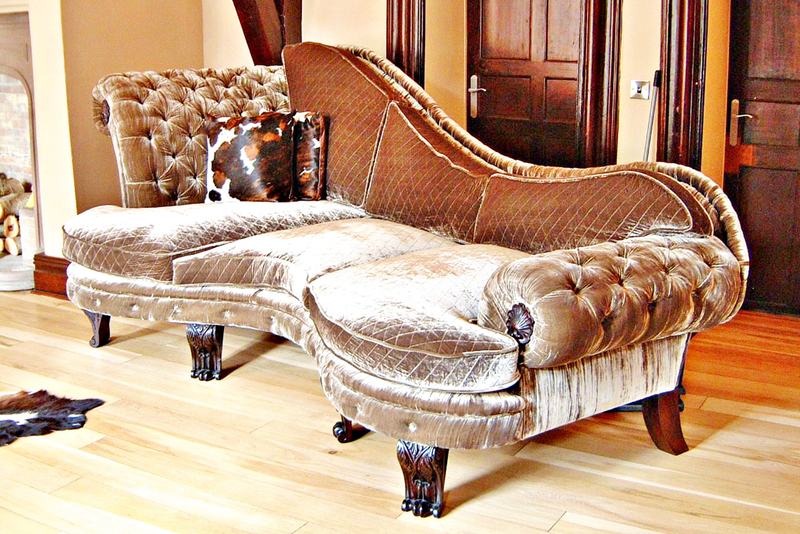 We are masters in bespoke furniture and have 35 years of furniture making experience. Contact us today to discuss your requirements and let us turn your dreams into a reality.